Learn all about romaine lettuce! Romaine lettuce is a head-forming lettuce recognized by its deep green color, long leaves, and crisp texture. 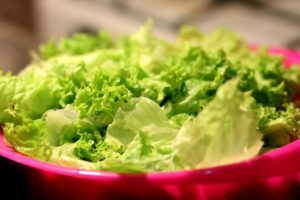 To be a more informed grocery shopper, read on for an overview about all there is to know about romaine lettuce. Romaine lettuce is one of the most popular types of lettuce, alongside crisphead, butterhead, and leaf lettuce. It has a slightly bitter flavor and is full of vitamins C and K. It is said to have originated from the Aegean Sea, off the coast of Turkey. Because of its high level of beta-carotene, romaine lettuce is a great source of vitamin A. It’s also a great source of dietary fiber, calcium, iron, manganese, potassium, and phosphorus. Adding more romaine to your diet will help prevent cholesterol oxidation, which can lead to artery blockage. The combination of these minerals and vitamins can help build up a string defense in your body against chronic ailments, especially when you make romaine part of an overall healthier lifestyle. The most common use of romaine lettuce is in salads, wraps, and sandwiches. It’s also a great idea to add romaine to smoothies with fruits so that you can drink the benefits. In Greek and Roman culture, it’s used in medicinal applications. In South Asia, romaine is used to treat insomnia and as an ingredient in tonics that treat intestinal and digestive issues. Many people are opting to grow their own fruits and vegetables in their home gardens. If you want to try your hand at growing your own supply, the best times of year are spring and fall. Even if you don’t have a lot of space for a full garden, you can also grow romaine in containers. It requires full sun exposure with ideal temperatures being between 45 to 80 degrees Fahrenheit. Be mindful that romaine deteriorates quickly, so keep an eye on it throughout the 60 to 70 days it takes to harvest. This entry was posted on Friday, January 25th, 2019 at 12:31 pm. Both comments and pings are currently closed.